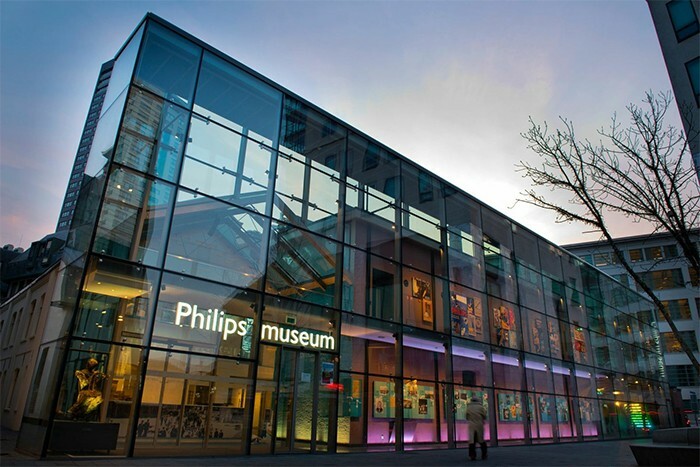 A selection of Philips Selecon and Philips Showline luminaires are lighting the new Philips Museum in Eindhoven - on the historic site where Philips produced the first incandescent lamp in 1891. Lighting designer George Ashley-Cound of Light Fantastic specified Philips Selecon PLfresnel1, PLprofile1, PLprofile4, Accent beamshapers, Showline SL BAND 300, Showline SL STRIP 400, and Showline SL BAR 520 luminaires for the museum project. The exhibition, which was opened to the public by Queen Beatrix of The Netherlands, charts Philips' evolution of Philips from a small incandescent lamp manufacturer into a large and prestigious international group of companies. Since opening in April the museum has welcomed more than 10,000 visitors. "The PLfresnel1, PLprofile1, PLprofile4s are versatile and precise and all are extremely adaptable for use within theatre, stage and gallery lighting," says Ashley-Cound. "The Selecon range of lighting blends almost seamlessly with the architecture to illuminate the museum as a permanent show - both the Selecon and Showline luminaires enable creative, energy efficient, and highly engineered solid state lighting. This contrasts beautifully with the old and well-loved, energy hungry, lighting equipment of the last century which is actually on display in the museum." "The PLfresnel1, PLprofile1, and PLprofile4 luminaires use the same proven LED engine as the Philips Selecon PL3, PLcyc1, PLcyc2, and the Philips Vari-Lite VLX wash luminaire ranges," continues Grant Bales Smith, Philips Entertainment's senior sales manager for EMEA. "This has ensured that colour matching is simplified across all luminaires lighting the stage. A key benefit of using these models together is that it's no longer necessary to change lamps or colour filter. In fact the Selecon fixtures offer superior control and light quality and enable seamless fading between colours allowing designers a new level of creativity." In addition the Showline SL BAND 300 is a compact colour mixing luminaire capable of providing a splash of colour wherever needed. With a native 10 degree beam angle and 2000 lumen output, the SL BAND 300 is the designer's choice for colourful output. The Showline SL STRIP 400 is a compact and bright linear wash luminaire available in both RGBW and Tunable white models. It accepts a range of standard beam spread accessories to adjust the standard 20 degree beam angle. The SL BAR 520 offers fantastic creative possibilities through extreme output from multiple blended sources. Each of the unit's six homogenised cells provides intense output at an 80 degree beam angle. The high output RGBW LED luminaire easily adapts to any production environment as it retains a traditional light source appearance. "The most wonderful job that a lighting designer could have is to be asked to illuminate the Philips museum," continues Ashley-Cound. "I feel the choice of lighting offered by Philips really is unrivalled and the huge investment the company has put into developing the LED solid state lighting fixtures has really paid off. The addition of Selecon, Showline, Strand, and Vari-Lite into the Philips family is also a very positive development. The investment has produced a range of lighting that brings the excitement and scenic control of big stage productions into the architectural environment. "From the bronze sculpture of the lamp girl making the classic GLS lamp at the entrance, along the time-line of history to the rainbow of LEDs lighting the way to the use of light to create healthier futures, it's clear that light has played a central role in the Philips story and is a strong and vibrant part of the future." The Philips Museum tells a story of innovation and ambitious enterprise with a focus on improving people's lives. It takes pride in the company's history and enables Philips to exhibit the origins and evolution of the global company with a view to the future. 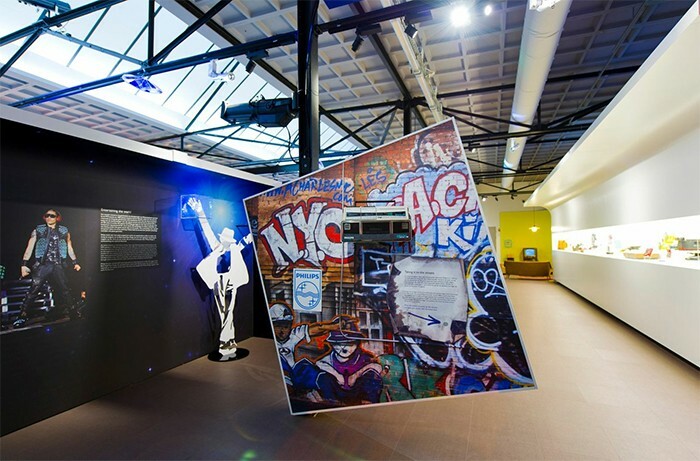 As Bob Roos, key account manager for Philips Entertainment in Scandinavia, Benelux, France, Spain and Portugal concludes: "It seems only natural that entertainment lighting equipment, designed and manufactured by Philips Entertainment brands Selecon and Showline, should illuminate this fascinating museum. With over 170 years of combined experience between the Philips Entertainment brands Strand Lighting, Selecon, Showline, and Vari-lite, we now offer the broadest range of lighting and control solutions for the concert, touring, theatre, TV, film and architectural environments." "As a company we are committed to the development of high performance lighting instruments," continues Brad Schiller product marketing manager for Philips Entertainment. "We're extremely proud to be part of the story that takes Philips from the first developers of incandescent bulbs to the tools, which today include innovative automated luminaires and compact portable dimmers through to sophisticated, interactive, networked lighting systems."